Morning pages and my old friend, The Grumps. Every morning my goal is to write three pages of thought stream. Sounds easy enough, but I can’t tell you how hard it is not to sensor myself! Even in a piece of writing that no one will see, I judge. I worry. I think too much. It has gotten better especially when I wake up too late and run out of time to finish before an impatient toddler wakes up! On these days, it is easier to just rush through and not think about it!! It has been such a great way to get the crazies out and get through to the real stuff that is in my head. My day goes better because my thoughts are clear. So here is the thing, on the days when I do my pages, I can be positive! It turns out that letting all the crap out of my head leaves space to be positive and grateful for this life. It helps me smile more and frown less and hopefully laugh more with my beautiful family. I am a worrier by nature, but this simple act of writing every morning helps me be a nicer and kinder person to everyone, including myself. I don’t like new years resolutions because I find it so hard to stick to something (that is for another story! ), but my goal this year is to keep up my Morning Pages so that I can share the best part of me instead of the part that is clogged up with grump. More writing, less grump. Here’s to 2013! Through the back window of our London house, I can see snapshots of other people’s lives in the windows of their homes. I can see the young couple who fight in the kitchen over who is washing and who is drying, who takes the garbage out, who stays home for the delivery man. I can see the mum who planned a birthday party for her daughter, where a guy from the London Zoo came over to the house with different lizards and chameleon type creatures. The children tried to act like they were too cool to show their excitement, but I could feel their eyes shining. I see the single guy who eats alone every night, but has started working on a rooftop patio conversion. I see the old lady who watches the news every night and then falls asleep on the sofa. Everyone packed so tightly into the converted apartments of the Victorian home, where only a wall divides you, but you barely know each other exists. If this were a game, I would pluck you all from your homes and place you where you should be. The old lady invited for dinner by the family with two children. There she could tell them how she once was a marine biologist, studying the lives of dolphins. Now that would impress them! The single man invited to a house party at the home of the fighting couple where he meets his future partner – the brother of the woman – and they soon celebrate their first anniversary on the newly finished patio. If I could, that is what I would do for you. I am sure we hear this voice all the time. In fact I just spent a day trying fight past those words just so I could get done real words down on my page. course I missed her, but she was in good hands. My mother took care of her for two nights while we adventured through the city of Amsterdam. Pure heaven to be free of little feet for a few days! The freedom was good for my creating soul and I did lots of writing while free of household worries and to-do lists. And the long wine filled dinners with my handsome date, helped a bit too! We visited the Van Gogh museum and I learned so much about this amazing artist that I have loved for so long. The thing that remained with me was his determination to get better. He refused to believe that he could not paint. His early works were highly criticised, but he kept on at it until finally he was a master. He maintained that the more he did the unfamiliar, the better he would get. The only way was up, basically. Now why do I want to be perfect the first time? What makes me so special that I don’t need to practise? The masters of creativity were great because they believed that they could succeed through hard work and determination. And they never listened to the voices that told them that this plan wouldn’t work. I am not really into politics. But, the night you were elected four years ago, I was the one who woke my husband up to tell him the news. I knew it was history in the making and I wanted to remember where I was when it happened. I am not even American, but I know that the world depends on America having the right man in the lead. Since you have become president, our lives have also changed dramatically in more personal ways. We moved countries and welcomed our daughter into the world. My husband stopped working for the man and started his own business. I gave up a job I loved to raise my beautiful baby. And on this election night, four years later, we have another kid on the way! A lot can happen in four years! Especially now that I have a child, I want her to grow up in a world where the best man does win. I know you didn’t do everything you said you would do. Some people seem to be bummed about that. But hey, I haven’t yet done what I set out to do yet. It doesn’t mean I am not going to do it. I think you will get your work done, if you are given the chance. Maybe people forget that you are human also and learning on the job. Maybe some people can’t remember that getting to where you are right now was huge. A game changer. A chance to do things differently. I hope you do get the chance tonight, because I think Americans need you to finish what you have started. Good luck from us on the other side of the ocean. I am sure that I’ll again be the first one in our house to find out that you are still president in the morning! I am so guilty of trying to write instead of just doing it. So many bloggy folks are doing Nanowrimo and I got excited and wanted to join in! I even told my hubby to do it too! Well, he got on the case….he actually got writing. And he doesn’t even want to be a writer….he is a business dude, for goodness sake. He is in the middle of starting a business. But yes, he got on the case and frankly, I am jealous that he is writing with abandon. Not worrying if the right word is on the page, but just getting it all down. He is going at it like the business guy that he is. It doesn’t have to be perfect, it just has to be started. Perfection can wait. It is a project to be completed for him. Just like a business. I guess I want to be like that. I don’t want to worry about each word. But I am a writer, a worrier, and an over thinker. I can take a few lessons from him, but in the end, I have to accept that I do it my way, otherwise I just end up getting so disappointed at myself. I am impressed at how he taps away at the keyboard, words flowing out all over the place. I can only try to take what I can take from the way he does it, and that is, perfection will have to wait. Getting it out on the paper can only bring more satisfaction than letting it sit in my head. There is a lovely, little place in my head that remains forever muddled. That is because it is the real me. I don’t mind being a bit muddled. But lately, it has become a thing. On the outside I have a great husband, a beautiful daughter and another baby on the way. I am a teacher taking time off to raise my kids. I am a mother, a wife, a daughter, an in-law, a sister. I am a lot of things I didn’t use to be. I used to be just a girl trying to figure it all out. Just me, on my own. Responsible for just myself. And that muddled, little place that was the real me was still a little hard to figure out, but I think I was getting there. But lately, all these other hats have made it even trickier to get to that little part that is the old me. So forgive me if sometimes I don’t act like I used to. It’s just that I am finding my way past all the hats. Sometimes things do start to fall into place if you ask and listen carefully enough. I met a wonderful illustrator who wants to work with me on two of my stories. I am so excited about it because he loves the same authors and illustrators that I do and he wants to create the same sort of books that I want to. It is just such a great match. His art is whimsical and wild and he cares about representing all kinds of children in books, brown, green and purple. He cares about the quality of the words in the story and the play of art mixed with words. My imagination is running away with me, thinking about all the book magic we could create! The Estate Agent, who I will call Danny, got quite interested in what I was saying and mentioned that he had a friend of a friend who was trying to get into illustration and would I mind looking at his portfolio. Would I mind? Would I mind? Errrrr. I would love to, I said. And all because I just put it out there, I was sent what I needed. I have been writing! Gasp!! When I first made the commitment to write, I found it so hard to get the up momentum to start the actual writing. I guess I felt frozen. Now ideas are really flowing well (touch wood). I am excited to sit down at the computer and spill all that is in my head. I guess what “they” say is true. The more you write, the more you write! I think I found it hard because I was writing stuff that I didn’t think was good. I want to be good right away….I am impatient about getting through that practice stuff….the learning stage. Odd, coming from a teacher, I know! I want to be great right away. But lately I have just been trying to get it all down, un-perfect, un-edited, even though this is hard for me because I need things to be neat and tidy. Then I will come back to it in a week or so and see what I have written and it seems to either be total crap, or sometimes, it’s something I quite like! So far, this is working…..
What a wonderful way to spend an afternoon. Some oil pastels, butterfly shaped card, glitter, leaves and feathers…….oh, and a cup of green tea. Artist’s dates came into my life this year (that story another day…) and they have really changed the way I think about creating. I used to really get down on myself for not having something to write or getting on with this storybook that I wanted to do. And then I used to sit and think and think and think about why I couldn’t trust in my own writing, even though I had so much that wanted to come out. Julia Cameron’s Artist’s Way course suggests going on a creative, playful date each week with just yourself. The idea is that if we let our minds wander and play, creativity is set free. 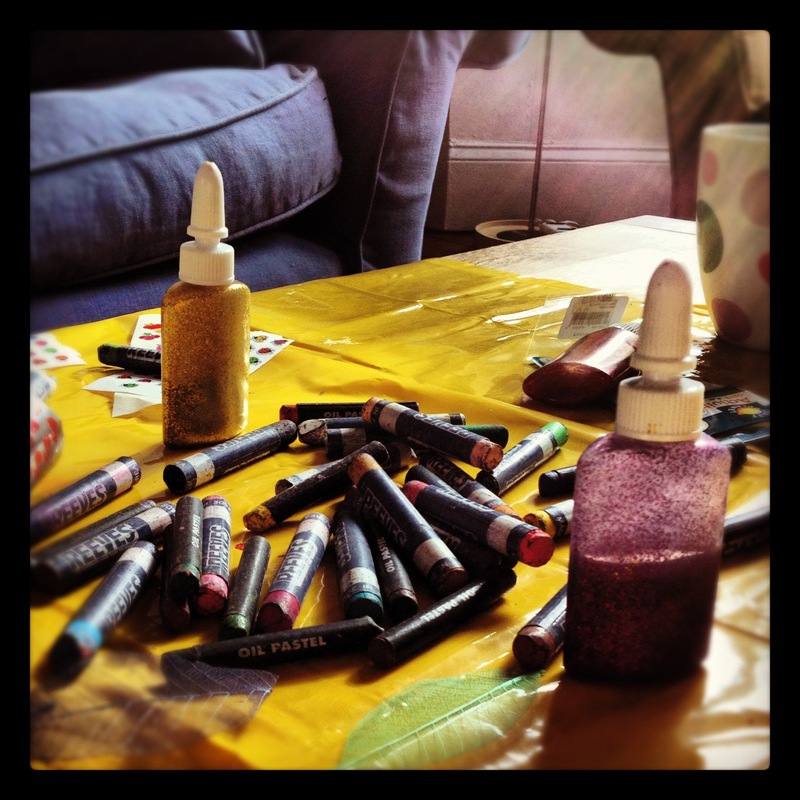 Sometimes we do a gallery, sometimes a walk through a pile of leaves, sometimes a good rummage in a charity shop for beautiful, forgotten things, and sometimes, like today, it involves glitter glue and sequins! Although I can’t do it every week, and more often than not, I do it with my Little Bee, it always leaves me feeling calmer and happier and ready to play with words. I have to share a lesson I learned from my two and three quarter year old daughter about being resilient. Tales from the Beehive is not supposed to be a gushy mummy blog. Bees On Skis is there for that. But this is the lesson anyway…. I am bold, but yet completely afraid of rejection. Paradox, I know, but we established all that at the beginning…I am a mad mix of everything opposite. This is what has kept me away from writing for so long. This fear has kept me from sharing anything at all (except blog posts!) with anyone. I don’t know why I am like this. The people around me in my life now are the most supportive and encouraging, and yet, I still can’t find the courage to just release my words to someone who will judge them. My daughter. She is resilient. I am in awe of this aspect of her personality. The other day, she walked up to a little boy at a party and told him (with her gorgeous smile), “Hello. Do you want to be my friend? I can be your friend, if you like.” No fear that this little boy was going to reject her at all. No shyness or worry. No nothing. Just a pure offering of herself in friendship because she really believes that she is a good friend. I can’t even do that at thirty three years old! Another day, she said to me after nursery, “Mamma, we have to see Nicholas soon. I really think he is missing me.” She just assumes her importance in the world and her importance to people and I think it is something to learn from. She values herself and what she has to give to herself, her friends and her family. I know this is all innocent toddler talk, but there is something in it that I have forgotten along the way. I would like to learn again the resilience I have tried to nurture in her. 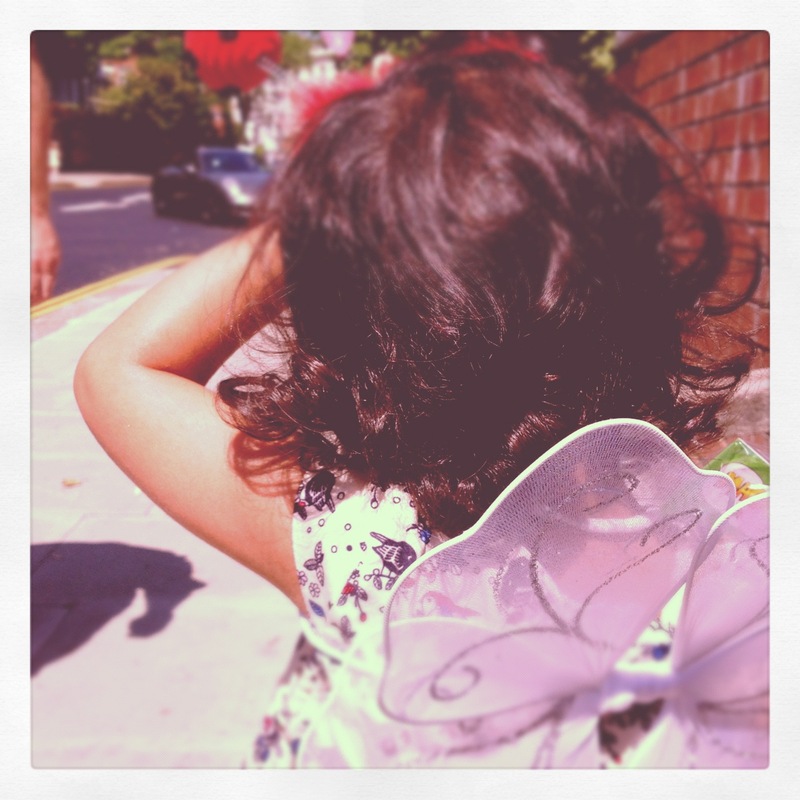 And also, she thinks she is magic when she wears her fairy wings. Maybe I need a pair of my own…..